The Quantum Currency Strength indicator displays dynamic strength and weakness in all timeframes. And better still – you configure it to match your own trading style. Make it your 'go to' indicator each time you consider a trade. Invest in one today – you deserve it. It’s a great question and one the video answers, but the reasons are very simple. First, the forex market is unique – no other market is quoted in pairs, so as forex traders we need to see inside the market. 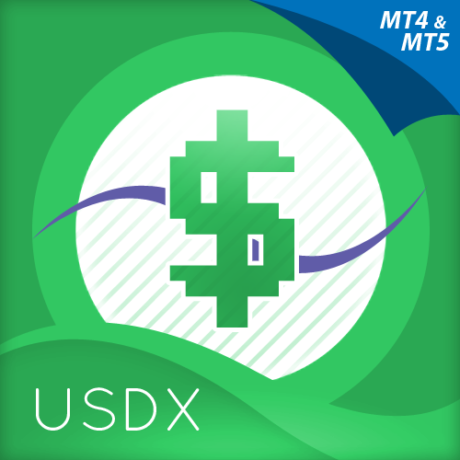 The building blocks of the forex market which are the individual currencies themselves. Once you start to see all the currencies displayed individually, then and only then do you have a visual picture of strength and weakness. 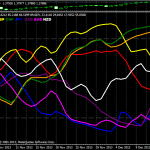 From there its a simple step to see which currency pair is strong and which is weak, and to select low risk trading opportunities based on an analysis of the chart. The currency strength indicator reveals the inner workings of the market, and the reason most forex traders fail, is that they cannot assess strength or weakness across 28 currency pairs easily or quickly. The forex markets are the only markets where you trade in pairs, and in order to succeed we need a tool to identify the underlying strength and weakness in each currency. 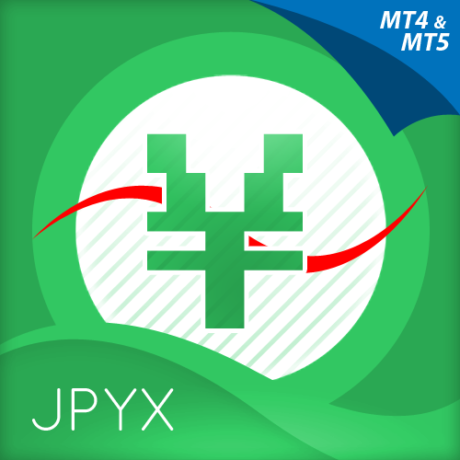 In other words, the split the currency pairs into their individual components. This is what the currency strength indicator does. 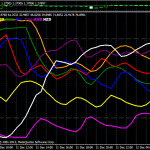 It breaks the currency markets down into the eight major currencies and displays strength and weakness in realtime. When a currency is strong it appears at the top of the currency strength indicator, and when it is weak it appears at the bottom. Then you simply choose from the 28 currency pairs available, and select those with the lowest risk. The currency strength indicator works in all timeframes and has been developed as a trading indicator for a variety of platforms, including MT4 and NinjaTrader. A simple question and a simple answer. The currency strength indicator will give you something which is truly priceless, and that’s confidence. Many traders struggle or fail simply through a lack of confidence. Trading is an emotional business and as such you need tools which will help to give you the confidence to get in, and more importantly to stay in. This is what the currency strength indicator does. Yes, it tells you whether a currency is strong or weak, but more importantly it then helps you to stay in a trade, once you are in the market. After all, getting in is easy, it’s staying in that’s really hard, and here the currently strength indicator will help you immensely, giving you the confidence to stay in and maximise your profits from each and every trade. It removes the emotion from your trading as you can actually SEE what each currency is doing in real time. Here we explain how the currency strength indicator works. One of the most important things to realise first is that the currency strength indicator works in real time from 1 minute to one month. So when you apply the currency strength indicator to a one minute chart, you will see the currencies moving higher and lower, in real time. Perhaps even more importantly, the currency strength indicator has been designed to be personalised to your style of trading. It gives you complete control over the speed at which the indicator works. After all, if you are as scalping forex trader, then you want to speed it up a little, and as a swing or trend trader, to slow it down a little. The currency strength indicator puts you in control helping you to maximise your profits, whatever your style of trading. 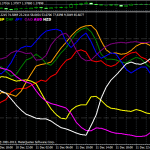 The indicator works by considering all the twenty eight currency pairs and their associated price action. A complex algorithm then displays the eight individual currencies relative to one another in real time. Finally the indicator can be fully customised in terms of style and colour, and also displays zonal lines to help you to identify when a currency is moving into an overbought or oversold region on the indicator. There’s more than one way to use the currency strength indicator, and in this video we explain several different and innovative ways to apply the indicator when trading the forex markets. After all, getting in is easy, but what about getting out. Here the currency strength indicator gives you clear signals to exit, one of the hardest things to judge in trading. Another tough thing to do, is nothing. When the currency markets are moving sideways, it’s time to stay out, but the question is how do we know. With the currency strength indicator you will, as this is displayed in real time, sending you a red flag signal to stay out. What about using it in multiple timeframes. Another great way to use the indicator. After all, if a currency is rising in multiple timeframes, then this is a low risk trading opportunity. 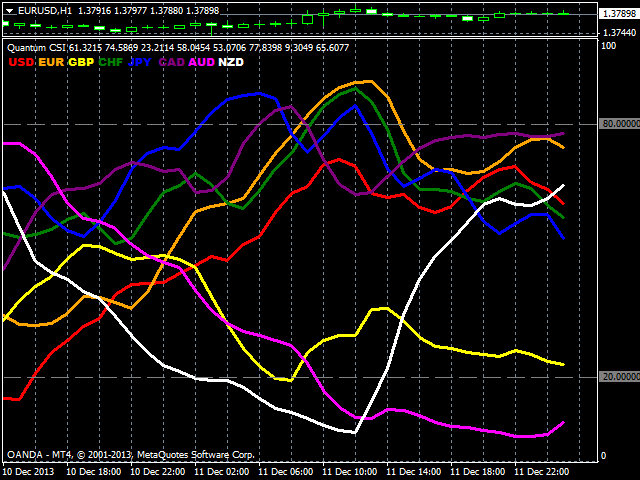 So with the currency strength indicator, you can be as creative as you like, and only limited by your imagination. If there is only one MT4 indicator you ever buy for trading forex – this has to be it. 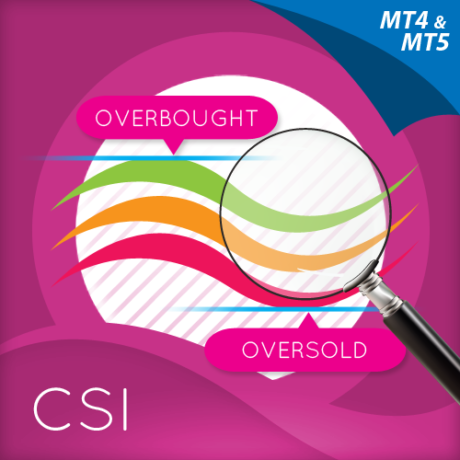 Your success as a forex trader depends on being able to identify when a currency or currency pair is oversold or overbought. If it is strong or weak. It is this concept which lies at the heart of forex trading. Without the Quantum Currency Strength indicator, it is almost impossible. There are simply too many currencies and too many pairs to do this quickly and easily yourself. You need help! The Quantum Currency Strength indicator has been designed with one simple objective in mind. To give you a bird’s eye view of the eight major currencies. To show you in a simple, quick and easy way, when a currency is either oversold or overbought. In other words, strong or weak. To help you, the indicator defines these regions for you, with a simple horizontal line. One near the top at 80, and the other near the bottom at 20. When a currency reaches the upper grey line, then it is approaching an overbought state, and when a currency touches the lower grey line, conversely it is approaching an oversold state. It is at these points that a trend is likely to reverse, offering you low risk trading opportunities. Something that you could never do quickly or easily yourself. It displays the eight currencies individually, giving you endless combinations of trading opportunities from scalping to swing and trend trading in all the various currency pairs. First – the indicator tells you when an individual currency is overbought or oversold. Strong or weak. Unlike some assets, currencies never go to zero. It is when they reach these extreme points, that currencies offer the lowest risk trading opportunities. These are the regions at which a currency is likely to reverse from a previous trend, giving you the potential to get into a low risk trading position early. Second – the indicator will also tell you when it is time to exit. After all, if it’s good enough to get you in, then it’s good enough to get you out as well! 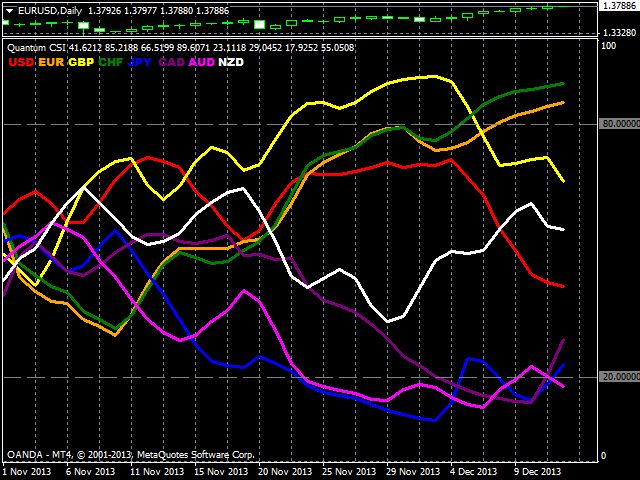 Third – when the currencies are all bunched together in the middle of the indicator – then guess what! It’s time to sit on the sidelines and wait. 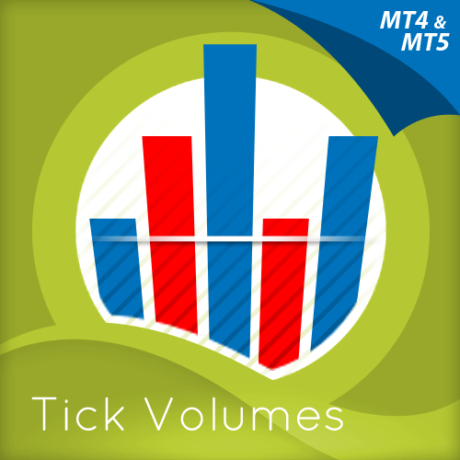 Finally, take your trading to another level using multiple timeframes. After all, if a currency is moving higher, or lower, across three timeframes, then even more reason to take a low risk trade. And if this wasn’t enough. There is even more! You can configure the indicator to your own trading style. Yes, you did read that last sentence correctly. You can fine tune the Quantum Currency Strength indicator to your own personal trading style. Think of it like the volume control on your radio. You adjust it to your own personal preference. Well it’s the same here. If you are a scalping trader, simply adjust one of the indicator settings to speed up the indicator. If you are a swing or trend trader, tweak the controls to slow it down a little – the choice is yours. More control means one thing – more consistency and greater profits. After all, why buy an indicator that you cannot match to your trading style? It would be like buying a radio with no volume control!!! 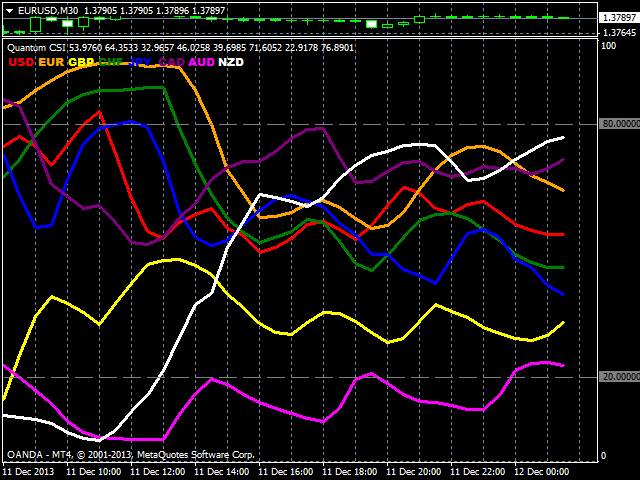 That’s why we call them the next generation of MT4 indicators. The Quantum Currency Strength indicator works with all MT4 brokers, even those where the currency has a suffix or prefix. It can be applied to both demo and live accounts. 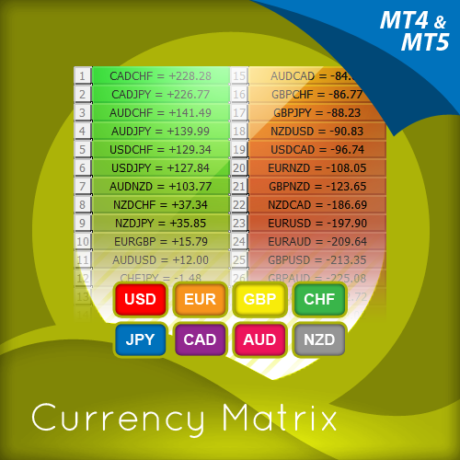 The currency colours can be changed to suit your personal preference, and works in all timeframes from 1 minute to 1 month.